10 Facts You Probably Didn’t Know About Collagen…the Glue that Holds Your Body Together and How the More Collagen You Have, The Younger You Look! We hear about collagen all the time, from supplements to anti-aging. There are very good reasons why collagen is important to our bodies and vital to our beauty. Collagen is essentially the glue that holds our bodies together. It gives our ligaments movement, our skin strength, and protects our organs. To help our clients understand how our body’s natural glue works, we have created a list of fun and interesting facts about collagen and why it is so amazing. Collagen is a naturally occurring protein produced in our bodies. It is found in our skin, bones, muscles, and more. Collagen can be derived from animals but for cosmetic use a safer synthetic collagen is used. Our bodies accept this synthetic collagen very well. Collagen makes up 1/3 of our bodies and a whopping 70% of our skin cells. Moisturize! The skins elasticity and strength are attributed to collagen. This is because collagen is essentially the “scaffolding” that holds all of our skin’s layers together. Cell turnover can stimulate collagen production. Cell turnover happens when the skin is damaged or irritated and it wants to heal itself. It does this by shedding dead skin cells quicker and replacing it with new skin cells. Collagen is an important part of this process. That is why treatments like facials and light therapy stimulate collagen production and newer smoother skin. Collagen fibrils are stronger than steel! A collagen fibril is small slender fiber and collagen bundles up in these fibrils to create structure and aid the elastin. Gram for gram, collagen fibrils are stronger than steel. Collagen is often used in dressing severe wounds or burns as it speeds up the healing process. Since collagen and healing cells go hand-in-hand, collagen aids in the process of skin renewal. Natural collagen production decreases with age as well as other factors like sun exposure and smoking. Hormonal changes can affect collagen production. Especially as we age during menopause. High sugar consumption can weaken collagen and make it brittle. Refined sugars increase bursts of inflammation in the body. Inflamed tissue produces an enzyme that actually breaks down collagen resulting in sagging skin. Degeneration of collagen within the body or slowed collagen production can pose health risks such as bleeding gums and joint pain. Since collagen is basically the main building block of our skin, muscles, and bones, all these parts of the body can degenerate. Also, being that just about 2/3 of our skin is made of collagen, losing it can negatively affect our appearance with wrinkling skin, dull/ thin hair, and cellulite. As shown here, young skin layers are very structured, firm, and smooth. As we age, and the collagen breaks down in the dermis, while the epidermis begins to sink and lose shape. We also see a significant reduction in Hyaluronic acid (essential for retaining moisture) and elastin, which gives our skin the flexible strength it needs. Internally, Collagen can be taken as a supplement. Collagen supplements have many health benefits like strengthening hair and nails, cardiovascular health, and reducing joint pain. However, for issues like wrinkles, loss of skin volume, and cellulite, there are better solutions available. How to stimulate collagen production so you can look like a Hollywood Screen star! Make sure and feed your body essential nutrients like vitamin C and antioxidants. Exercise! Especially HGH (Human Growth Hormone) producing exercises like strength and resistance training. This hormone stimulates collagen. We know, it’s a lot of information to take in. Collagen is what holds our bodies together and is key to many benefits including health and beauty. Did any of these facts surprise you? Let us know! 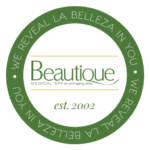 Because we are an anti-aging clinic, Beautique Medical Spa specializes in services specifically designed to increase collagen production. If you liked what you read, please like and share this article.